When I travel around the world, I’m often asked what should a first-time visitor to the United States not miss. And I give the same answer to everyone: the national parks. I believe it’s these varied lands -- in about seven weeks the National Park System turns 100 years old -- that is one of the very best treasures in the country. So it was with great delight that I read Lassoing the Sun by Mark Woods. It’s his year-long journey visiting 15 parks -- I’ve traveled to 13 of them -- that’s an ode to these great places of beauty as well as an inquiry into whether and how they can be preserved for future generations. But it’s also a tale about family, since he spent many summers as a boy in the national parks, and intended to take his mother to one park she had never visited. But, everything changed when his mother became gravely ill, succumbing to cancer. The book is a reflection on how visiting the national parks boils down to a life of utter simplicity, providing a sense of comfort and a healing energy. While in the Grand Canyon, Woods daydreamed, “...something that came naturally when we were children...I watched the clouds and listened to the vast stillness. The great loneliness.” In our everyday lives where we are uniformly tied to our devices, this is almost an alien experience. And, yet, the national parks wait patiently for us to experience them, embracing us once we do. Woods contemplates their future and the many challenges the parks face. In his last chapter on Haleakala National Park -- and the book's title derives from a lovely Native American legend centering on Haleakala's home, Maui -- Woods reflects how he hardly saw many sunsets in a given year. But, his year in the national parks was different. 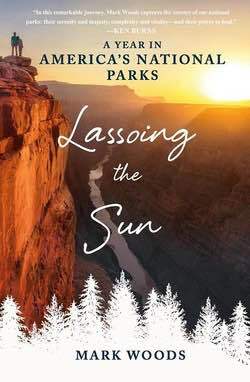 “In this year, even when I wasn’t watching one, I was aware of the light changing and another day turning to night.” This is a book both for those who, like me, adore the outdoors, especially the national parks, and for those who rarely take their eyes off their iPhone. I’m hoping reading this book (on a device) will seduce those latter people to set foot in a national park where they’ll find their senses tingling with simple delight, as if they were a child again.